Introduced to the pipe tobacco world in Svendborg, Denmark in 1887, Mac Baren today, is still known the world over as the premier makers of pipe smoking mixtures and blends. Every Mac Baren pipe tobacco blend is produced from various special recipes that are closely guarded by the company to help preserve their exact details and unique taste. Pipe smoking connoisseurs love the European and American style tobaccos blends Mac Baren has perfectly infused together. Each style they produce offers both aromatic and non-aromatic blends with different flavors and strength profiles. The results of all this effort, gives pipe smokers an elegant smooth and relaxing smoking experience. 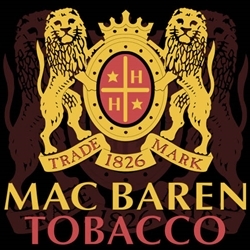 Smokers Discounts can bring Mac Baren Pipe Tobacco right to your doorstep. We’ve made it easy and affordable to buy premium pipe tobacco online. A variety of sizes and flavors are listed below. Each of these styles are in stock and available for a low discount price! Mac Baren Pipe Tobacco is available in: 1 lb. / 16 oz. and 5 lbs. / 80 oz. Bulk Pipe Tobacco size bags!